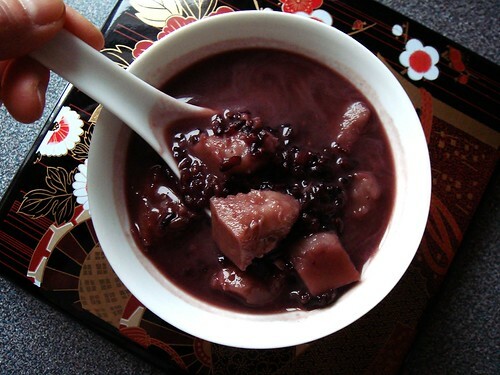 Dessert soup is not a common concept in North American cookery but it’s ubiquity in Cantonese dessert is on par with cakes in the Western sweet kitchen. 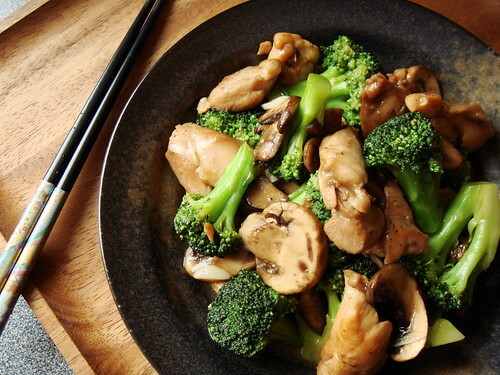 Food plays a strong role in the traditional Chinese holistic approach to health. Of course in addition to savoury soup, there is a dessert soup suitable for every ailment, seasonal change, and enrichment for the body. I never quite understand this holistic perspective. To me, dessert soup is simply an appropriate end to a meal or a great option for late night snack. The natural sweetness of fruit means that they are better enjoyed fresh as nature intended. Therefore you would not find much dessert soup made with fruit. So what goes in dessert soup? 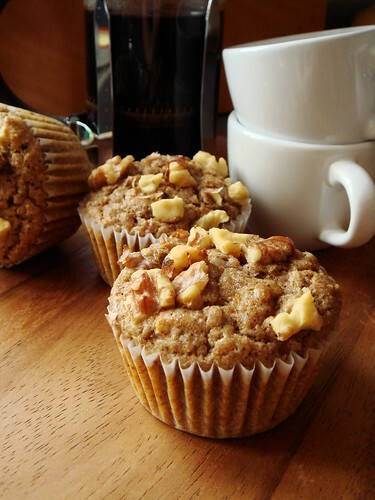 The usual suspects run the gamut of whole grains, beans, root vegetable, and nuts. I can understand why they never quite gain the popularity of savoury Chinese dishes in the Western world. The concept of using these “side dish” ingredients in a dessert application is just too far off to appeal to the masses. However, since I was brought up on dessert soup, I love them just as much any cookies, brownies, cakes, and puddings. I’ve been thinking about my Mom a lot lately. This year marks the tenth anniversary since she passed away and it continues to be difficult for me to grasp that she’s no longer with us. Among the many things that she taught me, some essential cooking skills serve me in very practical ways. I often say that I am better at following recipes than cooking intuitively. I’m referring to food that we encounter often in mainstream North America food media. The majority of these food are of French, American, Latin, or Italian background. What I neglect to acknowledge even to myself is that the food I grow up with, I can cook without thinking. The understanding of these Cantonese home cook dishes and the skills to make them are so much a part of me, a part that my Mom instilled in me, that I do not give them enough recognition. In Cantonese cooking, there are a few key techniques including steaming, stir frying, braising, and deep frying. I learned these skills the old fashioned way, by watching and helping my Mom preparing dinner day in and day out. When she returned from grocery shopping, there would be much slicing and marinating of various meats. A bit of oil, a bit of cornstarch, pinch of salt, sprinkle of sugar, splash of soy sauce, and some cooking wine form the basis of much of her cooking. 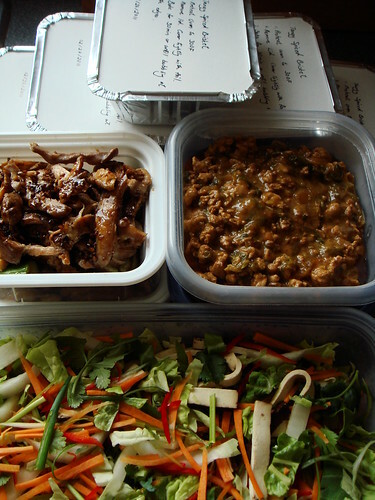 She would pack everything in single meal portions to streamline meal time preparation. A typical dinner at our home would involve a soup (slow cooked or quick boil), a steamed dish cooked in the electric rice cooker, and a stir fried dish. Not only does the meal offered variety, it was a good strategy to ensure all dishes would cook simultaneously and were served piping hot. I haven’t learned to appreciate these little practical details until I become the chef of my own home kitchen. For the last couple of months, I settled into a nice rhythm of trying out recipes with groups of bloggers at French Fridays with Dorie and BAKED Sunday Mornings. However, both of them have to take a backseat this week due to an unforeseen circumstance. My good buddy from speed skating sustains a serious injury from an accident on Monday and he’s housebound for a while. I am not a good nurse but this is one of the few occasions my cooking skill can be put to practical use. Upon learning the bad news on Thursday, I immediately volunteered to stock his fridge with nutritious home cooking so that would be one less thing for him to worry about. I believe in the healing power of food, both physically and emotionally. It goes without saying that his body needs balanced nutrition to recover from his injury. On the other hand, with family thousands of miles away, I hope that a bit of home cooked food everyday can help to keep his spirits up. Of course I want to prepare food that he would enjoy so that’s where my challenge comes in. I can neatly sum it up as follows: meat and Chinese cuisine. Neither of them are my specialties when it comes to cooking. Like any good challenge, there is a pressing deadline. I plan to deliver my Ginormous Care Package on Saturday afternoon so that gave me 48 hours to prepare. I made quick stops at the stores on Thursday night and my thoughts were moving at light speed as I planned my menu on the fly. For the most part, I want dishes that keep well in the freezer and reheat beautifully. Unfortunately, most vegetable do not survive this treatment very well so I also want to include dishes for more immediate consumption. My game plan consists of slow-cooked meat dishes for mains and salad/lightly pickled preparation for sides. My love affair with potato salad began years ago when I had my first taste of KFC. I know I know, please don’t judge. I was a kid with an equally inexperienced palate. Since then, I’ve discovered just how awesome a well-made potato salad can be, especially one made with homemade mayonnaise. Like most delicious bites, there is a hefty price to pay in the form of calories and fats. I am trying hard to get back in shape by end of March in preparation for inline speed skating race season and I have to be more shrewd in my food choices. I am not keen on processed food and low-fat/low-cal processed food are even scarier. I am determined to come up with a creamy potato salad that I enjoy without wrecking havoc on my diet. What do I look for in a good creamy potato salad? Aside from the creamy tangy dressing with a bit of kick, I also want The Works. Chunks of potatoes that hold their shape after boiling. Crunchy finely chopped add-ins such as red onion, celery, and dill pickles that deliver little pops of flavour. Equally finely chopped hardboiled eggs for a little richness. All finished off with a bit of fresh herb such as dill or parsley or chives to keep the salad from being too heavy. Oil is a highly concentrate source of calories. Mayonnaise is typically between 78-85% oil and one tablespoon will likely set me back 100kCal. Now imagine a recipe of potato salad with 2lb of potatoes. One would need at least 1/2 cup of mayonnaise to dress all that potatoes! 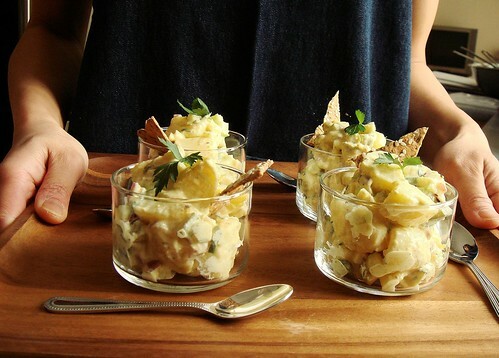 It should be obvious why creamy potato salad is such a fattening treat. What I like about mayonnaise is the creamy taste and the tangy seasoning. While I loathe to use a low-fat version, there’s nothing to stop me from using another creamy dressing seasoned similarly. I immediately thought of non-fat Greek yogurt and low-fat sour cream. As long as you look at the ingredients carefully, both of these dairy products are readily available in their real food version made with skim milk and bacterial culture (i.e. no additives like corn starch or guar gum to enhance the texture). 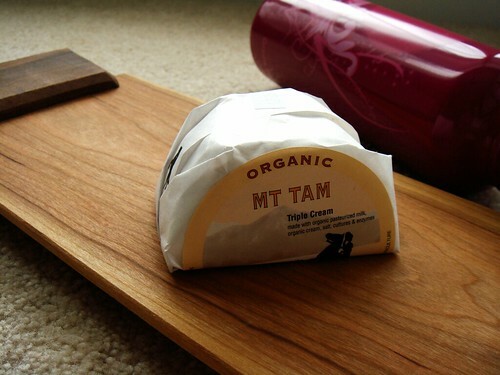 Aside from being naturally low fat, they also provide a healthy dose of protein. What’s not to like? Feisty Green Beans, Feisty Indeed! Apparently it is Green Bean Week here at Dessert By Candy. I am now on my third dish since last Friday’s Pancetta Green Beans and Monday’s Green Bean Salad with Fried Almonds. The flavour of each recipe is bolder than the last and today’s rendition required plenty of contribution from my spice rack. When I read 101 cookbook’s Feisty Green Beans, I was not at all deterred by the 18 items long ingredient list. In fact, the mix of spices had me excited about the promised boost in flavour. 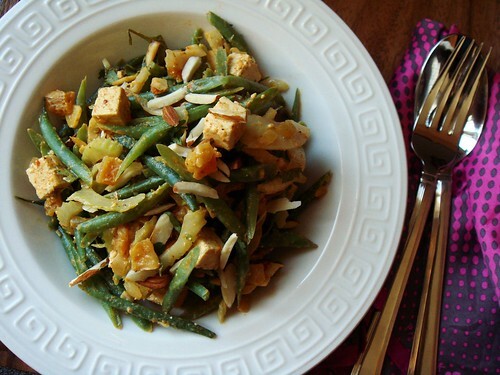 Lightly blanched green beans are tossed together with a sort of dry curry before mixing with firm tofu, golden raisins, toasted almonds, cilantro, and crème fraiche. Green beans are definitely the star of the dish but there are plenty of other interesting things going on to keep your guessing. This is definitely my kind of food. 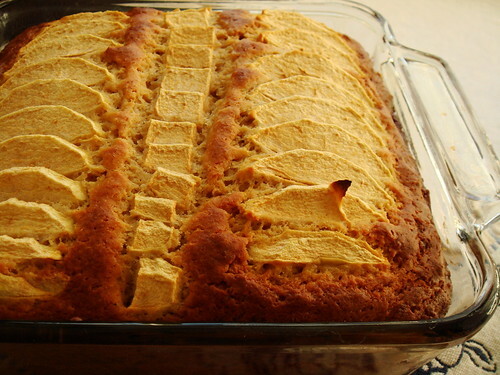 Swanson’s recipe has a British slant with the use of golden raisins and curry powder. I decided to take mine to Northern Africa since my crush with ras el hanout and apricot sees no sign of waning yet. I also wanted to incorporate other crunchy vegetable to complement the crispness of blanched green beans. Shaved fennel and celery were such a big hit in Monday’s green bean salad so why not here? In addition to being crunchy, they also contribute some background notes with their distinctive flavour. I also lightened up the dish by using non-fat Greek yogurt instead of the richer crème fraiche or sour cream. To make the yogurt more tangy, a few squeezes of lemon juice did the trick. It was a lot of chopping and measuring before my mise en place was ready. The cooking itself was a breeze so it was a decent trade-off. Honestly though, when the result is this impressive, there’s no question in my mind I would do it all over again. Rice pudding was constantly on my mind during my last visit to Virginia because BF participates in a herdshare program to have weekly raw milk pick up. Without all the bells and whistles, rice pudding is a a simple delight of creamy rice plumped with milk. The quality of ingredients can really shine in this preparation. I did not make any rice pudding last time though I made up for missed opportunity by an excellent rendition of saffron rice pudding once I returned home. Of course it was not made with raw milk and the spotlight turned to the exotic spicing and tangy creme fraiche. This time around, I was determined to fulfill my rice pudding craving. I began from a solid recipe from smitten kitchen and worked from there. Her pudding was flavoured with vanilla beans, bay leaf, and almond extract. Since I lacked all three ingredients, I took mine to a different direction. 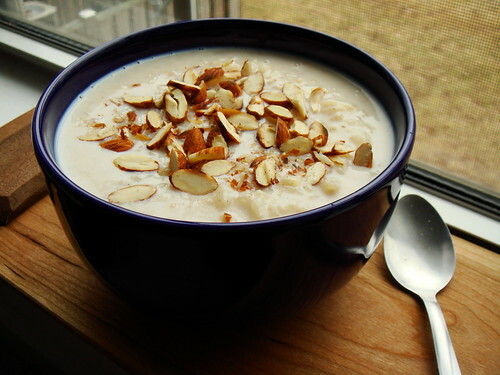 My rice pudding is scented with a delicious blend of cinnamon including Ceylon, Saigon, and Chinese cassia. I love this signature blend from Penzey’s! Each serving was topped with olive oil roasted almond also flavoured with cinnamon for some textural contrast. At first glance, it may appear that the proportion of milk to rice does not seem right. In fact, at the beginning of cooking, it felt like there was barely any rice grains swimming in a big pot of milk. However, Arborio rice has a way to really plump up and releases plenty of creamy starch toward the last stage of cooking. After an overnight chill in the fridge, the consistency thickens up nicely. Just hang tight and let the magic happen. Arborio rice is the type of short grain rice used for risotto. Carnaroli is another option if that’s what you have. Long grain rice such as basmati would not produce the same creamy consistency. It will be a long time before I get to work with raw milk again but I sure am glad to return to the comfort of my own home and the familiarity of my own kitchen. My penchant for picnic was put to good use today. BF and I went hiking at Shenandoah National Park in Virginia. The trail up the Old Rag Mountain is 8.8mi with some challenging climbs and scrambles over rocks. The change in altitude was over 2400ft! Obviously, while BF took care of the logistics of getting to the trail, my thoughts immediately turned to lunch. The hike was a whole day outing so of course what to eat was my main concern. Luckily, even without any advanced preparation, I put together an absolutely delicious and portable picnic for the two of us. All thanks to an utterly amazing Green Bean Salad with Fried Almonds from smitten kitchen. BF is not a fan of vegetable but my hunch is that he has rarely been exposed to properly prepared vegetable dishes. We recently had lunch at a pub and a side dish was green beans cooked to oblivion in a pool of grease. We turned our nose up unanimously and he told me that was the way he had came to know green beans. No wonder he didn’t like them! I’m on a green bean kick recently and can’t get enough of their crunchy goodness. When smitten kitchen posted her recipe for green bean salad, I simply had to make it at the first opportunity. 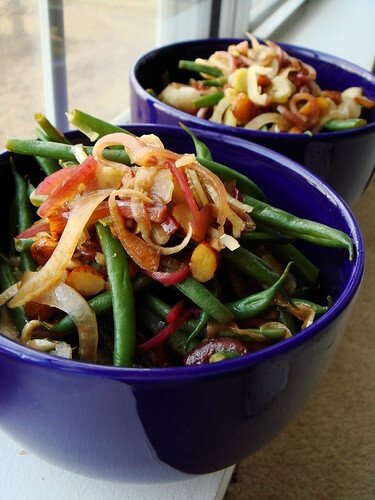 This simple salad is a mix of blanched green beans, red onion lightly pickled in balsamic vinegar, shaved fennel, and olive oil fried almonds. Don’t let the simplicity fool you because the taste is anything but. Every ingredient is crunchy in its own unique way. The sweetness of the beans, the liquorice undertone of fennel, the bite of red onion, and the richness of almond all tied together by the tart sweet balsamic vinegar are absolutely amazing. Even the self-proclaimed bean-hater had seconds and couldn’t stop raving about the salad. The best part is that this salad keeps well! We enjoyed it for dinner and the leftovers were packed away in individual serving plastic containers. They practically begged to be taken outside for picnic! Most avid home cook can tell you how their kitchen is arranged just the way they like it with everything within reach in the most logical way. So when faced with the task of cooking in someone else’s kitchen, a minimally equipped bachelor’s kitchen no less, things can be challenging. Back in December I traveled to Virginia and did a significant amount of cooking at my BF’s kitchen. I basically shipped and packed enough kitchenware to make it possible. Upon my return, I also brought many of my things home with me. So this weekend, I am once again faced with that same old problem. What is different this time is that I’m more savvy when it comes to putting meals on the table that are delicious yet easy. Take dessert for example. Homemade dessert from scratch is probably one of the “best value” skill I possess. It is not hard to master but the impact of serving a cake made from scratch almost guarantee to impress. Of course it also helps that my BF has a sweet tooth. The classic quick bread mixing method is truly my best friend. I’ve been doing plenty of experimenting lately and the traditional French yogurt cake is one of my favourites. 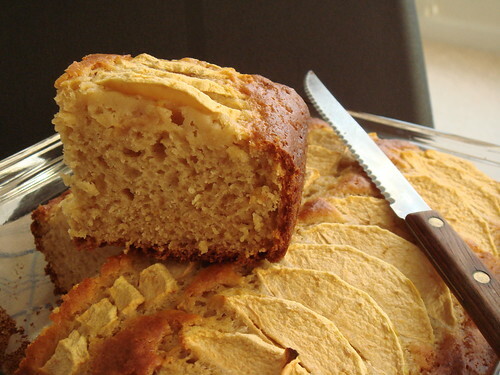 The cake is tender and absolutely delicious unadorned. Yet the basic recipe invites variations to make it as special as I wish. Last night, I made the Apple & Maple Yogurt Cake from Chocolate & Zucchini as the sweet ending to our dinner of pan-seared Stachowski duck sausage, green bean salad with fried almonds, roasted butternut squash with Parisien Bonnes Herbes, and a cheese plate of Blue Ridge Dairy applewood smoked mozzarella and Cowgirl Creamery Mt Tam. Can you tell I managed to convince BF to visit Falls Church Farmers’ Market with me on an early weekend morning?